The capital of Turks and Caicos is on Grand Turk which is the most eastern isle. It is called Cockburn Town. All the islands are virtually flat and sit on top of an underwater plateau which also ensures that Turks and Caicos has some of the best Marine Parks in the world. The main Turks and Caicos island from a tourism point of view is Providenciales. Most of the island’s population of 22,000 people live on Providenciales. It is also the westernmost isle of the map. This is where the famous beach called Grace Bay Beach is located. The beach which is 3 miles (4.8 kilometres) long is truly one of the most exquisite in the Caribbean with perfect soft white sand and crystal-clear salt waters for you to indulge in during your secluded retreat. This is also where you will find many of our luxury villa rentals, hotels and resorts in Turks and Caicos. Some of our favourite standalone villas on the coast along Grace Bay Beach include Amazing Grace, Saving Grace, and the one bedroom beach house Sugar Kube. You might also come across the captivating sugar-fine sandy beach of Long Bay beach during your stay here. In addition, we have some exquisite luxury Turks and Caicos villas located on Grace Bay. They have the advantage of having all the space and luxury of a fully furnished villa but can directly access the amazing communal facilities such as spas, pools, kid’s clubs, restaurants, bars and fitness facilities, as well as friendly staff. The one thing they all have in common is that they will have been personally inspected by us and they will all have to reach the Exceptional criteria to be featured with us. Some of our favourite Turks and Caicos rental properties are located in the Somerset on Grace Bay, The Palms, the Sailrock resort and the super modern and contemporary Gansevoort. The main island of Providenciales, also known as Provo, is also the gateway to Parrot Cay which is a stunning private island comprising of about one thousand acres of land. This is one of the most beautiful and exclusive villa destinations in the world, perfect for celebrating special events, such as weddings. Parrot Cay is operated by COMO and we are very pleased to represent many of the best and most luxurious villas on the island. Some of our featured villas include The Sanctuary and Tamarind Villa. The islands are charming and very unspoiled with breath-taking powdery white sandy beaches, endless crystal clear turquoise waters, nature reserves and several beautiful national parks. Turks and Caicos is one of the best places in the Caribbean to enjoy a romantic, tropical sunset and it also has several hundred kilometres of beautiful colourful coral reefs making it a superb choice for anyone who would love to go scuba diving, snorkeling or enjoy lots of water sports. Turks and Caicos is also well known for its varied salt water sea and wildlife. It is a great playground for dolphins, iguanas and ospreys. The sea passage called Turks Head Passage which divided the islands into two groups is also the transit point for migrating humpback whales which may often be spotted every year from January through April. The quaint area of Turtle Cove is a lovely place to visit while on Provo and it is home to many of our luxury villas. This cove is a vibrant area for is incredible Marina and activities it provides for you. This beautiful location homes clear shallows pools of waters and turquois blue reefs. This securely sheltered complex is the largest marina on the island and home to many water sport businesses, boat cruise and fishing operators, along with private vessels of varying size. The beaches here provide the best snorkeling in the Turks Caicos Islands as the waters are crystalline and the reefs are well-preserved. Chalk Sound is another location that you might visit during your stay here. Chalk Sound is based more closely to Taylor Bay beach. This location is also an ideal area for you to explore the clear waters and experience the endless colour pallet of tropical fish. You will also be able to regularly spot Eagle Rays, Manta Rays, Turtles and a variety of exotic fish including Blue Marlin, Tuna and Wahoo. The islands of Turks and Caicos also have great sport facilities that are close by, such as golf, fishing, horse riding, tennis, cycling, hiking and swimming as well as some areas of great historical interest, the list is endless. 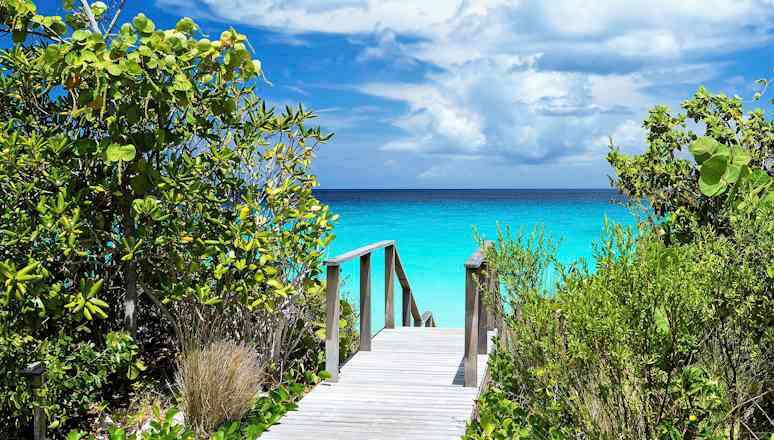 To find out more info about all the wonderful things there are to do on the island, take a look at our comprehensive Turks and Caicos travel guide and our page on Things to Do in Turks and Caicos. Getting to Turks and Caicos is relatively simple. There are two main airports on the islands. The main international gateway is on Providenciales and there is a second smaller airport on Grand Turk. The smaller islands also have airports which accept regional traffic. There is excellent direct access from Miami, New York, Charlotte, Boston, Philadelphia, Dallas, Toronto and Montreal. From Europe there is a twice weekly direct flight from London to Turks and Caicos. Aine is our Villa Expert for Turks and Caicos. She has a vast amount of knowledge of both the islands and the Turks and Caicos rentals that we feature. She has spent a lot of time in the Caribbean and is extremely passionate about what she does. She will spend time matching the right villa for you to rent, according to your desired wishes and dreams. Aine can also find for you the best villa Antigua has available, St Lucia villas, and Dominican Republic rentals. The Exceptional Villas ethos is all about trust and we are very pleased to be the most trusted villa company in the world by Google. We are also proud of our consistent five-star reviews on trip advisor and trust pilot. Once you have made your booking and the dates are set, you will be in the very capable hands of Noreen. Noreen knows the islands inside out and will be able to recommend all the best things to see and do during your adventure packed days here. She will also be able to organise all your ground transportation, VIP fast track at Providenciales international airport, car hire, tours and cooking courses, limousine services, boat trips, restaurant reservations, water sports and just about every part of your vacation. She will ensure you have the most relaxing time possible and this is all with our compliments. Turks and Caicos is without a doubt one of the best maintained, most prestigious and most exclusive of the Caribbean islands. These things together with the pristine nature of the unspoilt beaches in Turks and Caicos regularly sees it voted as a clear favourite and number one destination in the Caribbean. Then if you are looking for all these elements combined with extra seclusion then the two private islands of Parrot Cay and Sail Rock are wonderful choices. If you are looking for Turks and Caicos Villas, such as Casa Varnishkes in Long Bay, please contact us and speak to our professional team. Browse and check out our website site to get more information on our best rates per night and per week, as well as the latest availability on our luxury villas in Turks and Caicos. The Turks and Caicos Islands are the place to go if you are looking for an unforgettable luxury vacation. There is no better place to be in the world then here. whether you want a couple’s retreat, a luxury villa for a family vacation or something in between, the island has so much to offer plus some of the world’s most luxurious vacation homes. If you want serenity and tranquillity than this is the island for you. 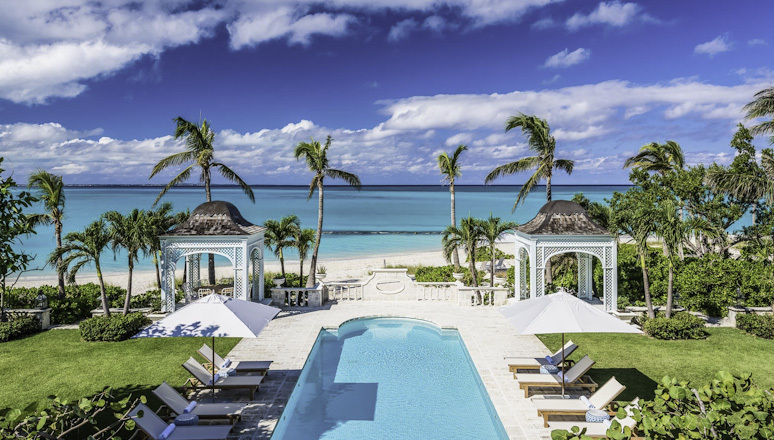 Turks and Caicos offers some the best beach front homes, luxury condos that are a short walk to the beach and others with amazing views overlooking the calm Caribbean Sea. The rentals Turks and Caicos offer you so much more space and privacy in terms of accommodation than a hotel. At Exceptional Villas we know it can be difficult to filter through all our Turks and Caicos luxury homes, don’t worry because that is what we are here for. We know that every minute spent planning your vacation is important and we want to make it easy and take the hard work out of it for you and save you time. Firstly, you’ll be put in touch with one of our villa experts who will speak to you in detail to find out exactly what you are looking for, next our team will send you their personal favourite recommendations, once you receive the suggested villas you can read all of the information on them and view the gallery and photos to see exactly what your villa looks like, our team will be on hand to help you every step of the way until finally, you choose and reserve your Turks and Caicos vacation rental and enjoy the best villa vacation imaginable. Our concierge will be on hand to plan the next steps of your vacation, the team are here to assist with all aspects of your trip from arranging your airport transfers, car rental, VIP meet and greet, arranging golf course tee times, good tours such as a visit to the outer cays or a private picnic on Sapodilla bay and excursions such as snorkelling or mountain biking, making restaurant reservations and so on. Our concierge can also assist with arranging a gourmet chef to cook for you in the comfort of your own luxury villa, this is a lovely way to enjoy a family vacation together and the chef will be on hand to cater for your every need. You can choose a menu in advance or leave it up to the chef. In most cases the chef will also do the shopping for you, so you need only relax and enjoy the aroma from the kitchen as you enjoy some well-deserved cocktails. Sailrock Resort is South Caicos’ premier resort nestled privately along one of the divine beaches that unfurl along the Caribbean Ocean. Sailrock is blessed to be home to the third-largest coral reef in the world and with warm clear blue waters, you and your group can snorkel in a rainbow of colourful marine life. Life on and in the water couldn’t be more enchanting. Sailrock Resort, also known as the Sail Rock Resort, or the South Caicos Ocean and Beach Resort, is a luxury Resort set on the serene landscape of the southern portion of Sail Rock peninsula. Cleverly designed on a ridge, 60 feet above the sparkling Colombus passage to the east and the Caicos Bank to the west, the Resort boasts unsurpassed sunrise and sunset views. The property is structured along clean Caribbean lines that see it blend naturally into its surroundings. Capturing all the alluring wonderment of nature without stinting on luxury. Large shaded verandas flow around your private pool, glass walls open out onto the deck that runs around the property. A casual yet sophisticated outdoor / indoor living experience awaits. There is a wonderfully calming vibration that captures your spirit from the moment you step into your lovely property. Each evening you will float away on a serene cloud of relaxation to the hypnotic sound of the ocean. Enjoy the pleasure of taking the shortest of walks on the white sandy beach that acts as the gateway to your stretch of turquoise ocean. Enjoy the scenic views and cool breezes from your oversized outdoor terrace and bask in the plentiful sunshine in peace and solitude. With 1.5 miles of uninterrupted beachfront, you can begin each day with a walk along the heavenly coastline at your doorstep. 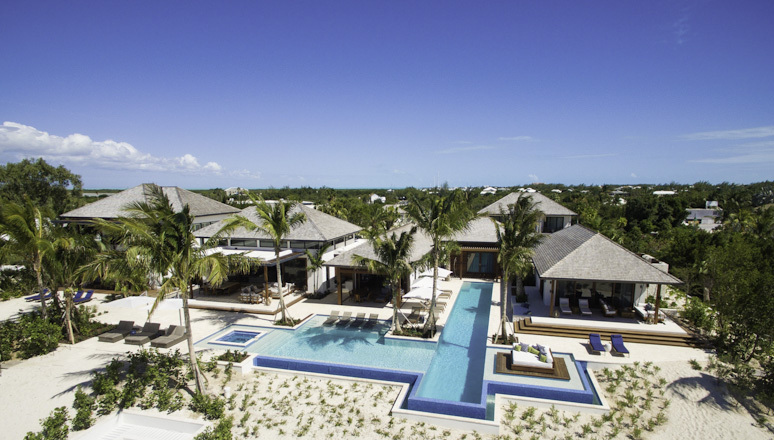 These beachfront villas at Turks and Caicos’ Sailrock Resort are ideally suited for families and group getaways. The Resort has a large temperature-controlled swimming pool, covered pergola for shade and spacious outdoor terrace with ample seating. This elegant 3-bedroom beachfront villa is elevated twenty-five feet above sea level for exceptional oceanfront views, with immediate access to the beach. Your Villa features an open-plan great room with exposed, vaulted ceiling. A fully equipped eat-in kitchen with island and pantry is a haven for those who like to cook on holiday. The wonderful array of seafood and local produce will turn anyone into a master chef, creating simple but delicious meals in an instance. A beautiful open plan living and dining room for guests to relax in the evenings and essentials such as a washer and dryer all combine to give you all of the creature comforts of home but located in a corner of paradise. The villa has three bathrooms, two have double vanities, large soaking tub, oversized walk-in shower, and gorgeous outside shower garden. The pleasure of taking a shower under the elements in secluded pleasure is a real treat. The third bedroom features double vanities and an oversized walk-in shower with sheltered garden patio with native stone privacy walls. Sailrock Resort is the perfect setting for connoisseurs of a true authentic island experience. With ridgetop suites elevated above the shoreline featuring stunning ocean views and beachfront villas mere steps from powder white beaches, Sailrock Resort gives new meaning to world-class service. The levels of exclusivity and relaxation in a luxurious out-island setting simply adds to the perfection of the location. Seventeen private rooms provide the finest amenities for guests. A variety of delicious dining options, secluded beaches, infinity pool, and an incomparable spa, the Resort caters for all tastes. Getting to this corner of paradise is very simple. With daily direct flights from most major cities and only a short connecting flight from Providenciales you will arrive onto South Caicos ready to unwind and relax. The island has developed a unique offering to visitors, namely, it has side-stepped the over-commercialisation that is taking place across some of the Caribbean’s most famous destinations. In a world that is fizzing with activity, stress, deadlines, South Caicos has seen the value that guests place on getting off the hamster wheel for a while and simply kicking back. If you want to vacation in rhythm with nature, waking with the sound of bird song at dawn, setting your schedule according to the arc of the sun in the limitless blue sky, then this is the place for you. South Caicos will allow you and your family to embrace all the beauty of nature as you shrug off the cares of urban living, along with your shoes, in this beach paradise. Fresh, open, sophisticated, sublime, exclusive … all words that capture the splendour of Conch Villa. This four-bedroom villa with fresh water pool, set in lush grounds manicured to perfection, rests gently on the edge of the award-winning Grace Bay beach. At over 12 miles, this sublime sandy paradise is the most desirable destination for visitors to the Turks and Caicos island of Providenciales. Welcome! The beautiful Conch Villa is one of our most luxurious and exceptional villas in Turks and Caicos and when you visit you will understand why this gorgeous property is rated so highly by guests. The owners, who recently completed a full refurbishment of this property, brought together the very best of finishes and decorative elegance that captures the spacious and exceptional design of the property. Each room is flows seamlessly into the other in natural linen tones. The dark wood flooring throughout coupled with the louvered windows is very reminiscent of traditional colonial living but this is wonderfully offset by contemporary furnishings that bring the villa very much into the 21st century. The sweeping glass walls that open out onto your garden paradise, frame a unique and commanding view over the ocean. With nothing to impede your views across your lawns to the sea, you can perch with your morning coffee on your terrace or stroll the short distance to the beach and start your day with a refreshing swim. Conch Villa’s location on the most stunning beach in Providenciales called Grace Bay is a gateway to all the best fun to be had on and off the water. The Bay which curls along the north shore of Providenciales for 12 miles (19 km) is lined with powdery white sands. Why not avail of the Villa’s snorkelling kits and get out on the water. The Turks and Caicos snorkelling is world famous with an array of sea life to dazzle visitors. Turtles, parrot fish, mild mannered sting rays all move around the balmy waters of the islands and provide so much enjoyment for the adventurous. The lovely Conch Villa is in the exclusive and secluded residential community of Leeward. At less than 10 miles to the international airport, your party will transfer to your island paradise in minutes. The stately entrance to your Villa home, leads you towards this contemporary and beautifully appointed villa. The level of detail to design both inside and outside the property ensures that the lush and colourful landscaping offers you the necessary privacy and exclusivity without limiting the sunlight, space and views. The moment you step onto this property you will instantly feel you have landed in paradise. This exquisite villa is surrounded by gorgeous gardens; an ideal place for you to lounge on the sunbeds, with a cocktail in hand, and absorb the breath-taking sea views. The villa is located on the world-famous Grace Bay beach and enjoys 100ft of pristine white sandy beach. Conch Villa is a newly refurbished chic four-bedroom villa which features a wonderful array of modern interiors. Only three miles from the centre of Grace Bay the villa is the perfect vacation home for the whole family to enjoy. You can unwind in the spacious state of the art living room of Conch Villa, watch a little TV on the impressive 60” flat screen whilst looking out to the panoramic ocean views. The fully equipped open plan kitchen offers both a gas stove and electric oven. It opens out to the formal dining area with a remarkable waterfall feature. Conch Villa comprises of four luxurious en-suite bedrooms. The magnificent master bedroom has a fantastic patio terrace which looks out onto the turquoise ocean. The master bathroom features an amazing pedestal tub and rain shower. Location is everything when you choose your holiday destination. Be assured that Grace Bay has everything you might need for the perfect getaway. Privacy, exclusivity but only a short hop to the nearest town, bars and restaurants. Golf is a mere 2 miles from your serene doorstep, boat rental, tours, day trips and many other adventures are all accessible to you and your group. You can be as busy or sedate as your party wishes. This amazing property will be your step off point for a holiday of a lifetime. Looking forward to seeing you here! Turks and Caicos is the most popular destination for the discerning traveller. Whether you want to enjoy unspoiled beautiful beaches, experience world-class snorkelling around amazing reefs, see wildlife thrive in their natural habitats, have a shoe-less family bonding holiday, this is the place for you. One of the very best places to weigh anchor in these glorious isles is the gorgeous North Shore Beach Enclave. 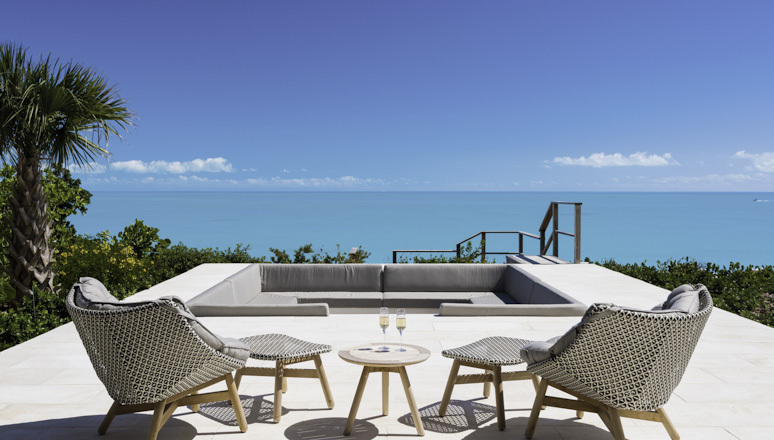 Four bedroomed villas, set at a slight elevation above the ocean, offer a peaceful and private sanctuary from which to launch yourself, body and soul into the wonders of life on Providenciales and Turks and Caicos as a whole. Beach Enclave is a beautiful beachfront community featuring nine magnificent four and five bedroom villas, ideal for multi-generational families or groups of friends. As it is located less than 10 minutes from the airport and only a short drive to Grace Bay, Beach Enclave is perfectly situated to ensure you have maximum time to kick-back and relax under the limitless skies. Your unique Villa, at 6,500 square feet, offers spacious indoor and outdoor areas where you and your guests can mingle and play or slip away to a quiet corner to meditate on life. The expanse of creamy stone floors, soft natural toned furnishings meld together into a backdrop of peaceful serenity that becomes the theme for your vacation. The very best of contemporary yet comfortable furniture, bed linens, and features create a plush yet homey sensation that gifts you as much ease as you would expect from a property of this calibre. The well-appointed kitchen and BBQ area will allow you to extend your recipe repertoire as you feast on the tropical delicacies of the freshest fish and seafood, mouth-watering fruits and vegetables. Each mouthful will bring you closer to the true experience of life on Turks and Caicos. For those of you taking a vacation from cooking, you are never more than a short distance to some wonderful local restaurants that offer traditional and local dishes that will appeal to all palates. The famous Fish Fry each Thursday in Providenciales is the place to see and be seen. Local ripshaw musicians create a foot-tapping sound track as you weave your way around the many street food vendors. You will want to try everything. The famous conch, jerk chicken, plantain …. It is so tasty and fresh. This is one of the top things to do on T&C and the Fish Fry welcomes guests from all over Turks and Caicos. It’s very family friendly and wraps up around 9.30pm. BE villas have over 100 feet of beachfront and private beach lounge areas. Each hilltop home has up to 67 feet of elevation and enjoy expansive panoramic views of the surrounding ocean. Each home also offers dedicated beach access and amenities, and signature details include an infinity-edge pool, built-in BBQ area, outdoor showers and multiple terraces and decks. Your sense of privacy and solitude that Beach Enclave Villas offers is cleverly balanced with all the services and amenities that the resort has to offer. There is an on-site reception that’s a great point of contact when you need advice or guidance. There is a fully equipped fitness centre that you can avail of. No excuses about letting your buff body fall under the influences of local delicacies as you can keep up your home fitness regime. There is a yoga terrace too for guests who like to take a gentler approach to their flexibility and mental clarity workouts. The Concierge Service at Beach Enclave will give you invaluable advice on where to go, what to see … all the useful local knowledge that will unlock a more meaningful holiday for you and your group. The ocean - blue, clear and sparkling – is the shortest stroll from your pool terrace. You can use the Beach Enclave non-motorised water-sports equipment – kayaks, wind surfers, snorkelling kits to get a closer look at all the beauty that exists on and under the water. Turks and Caicos are famous for its coral reefs. Turtles, parrot fish and many other colourful reef fish, swish by in mesmerising groups. It is a riot of colour. An energetic kaleidoscope of jewel colours moving through the sunlit water. You will be transfixed. Beach Enclave is that wonderful happy destination that brings beauty, serenity and luxury together in one luscious package. Whether you splash about in your infinity pool and air-dry under the balmy skies of this magical destination or leap into the warm waters of marine exploration, there is more than enough to enjoy right on your doorstep. I really hope that you do pry yourself away from this gorgeous villa to get out and about on Providenciales to enjoy the local colour and the warm welcome of the Turk and Caicos natives. There is something quite hypnotic about life on these islands. You will find yourself living without shoes and even a watch – setting your schedule by the journey of the sun across the limitless skies. Your ultra-relaxing vacation experience is waiting for you at Beach Enclave, North Shore. What are the hallmarks of successful interior design? It is universally acknowledged that it is the measure of how much you learn about a property’s owner when you walk through their home. Nowhere, in Turks and Caicos, is this truer than when you step onto the exclusive and glamorous residence, The Sanctuary on Parrot Cay. The celebrated and award-winning designer, Donna Karan, has created a home of such style and elegance that highlights her talents of creative invention. Welcome! Exclusivity is taken to new heights as you arrive onto Parrot Cay. It is one of the lovely islands, a short hop from Providenciales that is completely private. Only those lucky guest or owners who have property on this small and beautiful island are permitted to come ashore and enjoy nature and tranquillity on a whole new level. This 11-bedroom property is divided into the main house with three bedrooms to two guest villas with four bedrooms each. The layout and design of the property means that your group can enjoy a certain amount of privacy from one another while also being able to come together and socialise as necessary. Each house is a self-contained, luxurious destination that can be rented on its own. 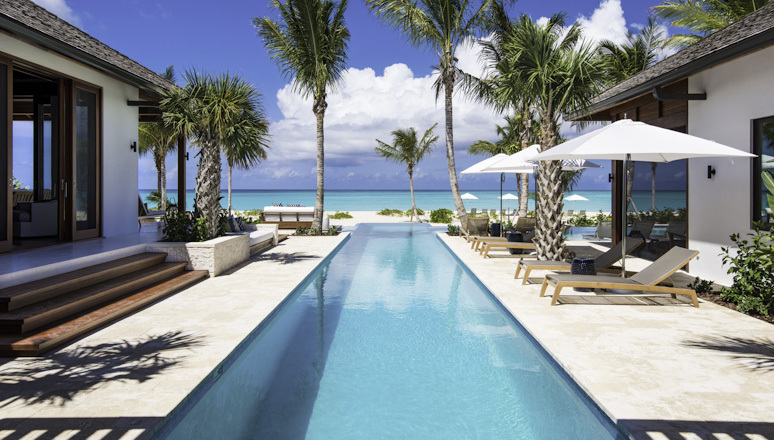 to The Sanctuary one of the world’s most exquisite and luxurious 11-bedroom beachfront villas located on the very exclusive private island of Parrot's Cay just a couple of minutes by boat from the main land of Turks and Caicos. This unique beach front property is made up of the main house which comprises of three bedrooms and two four-bedroom guest houses. Each house can be rented separately or as one villa with a total of 11 bedrooms. Four swimming pools offer a refreshing cool dip for guests in any of the villas. Private sundecks capture the wonderful sunlight during the day and the peaceful murmur of the ocean at night. Your own stretch of private beach awaits a few steps beyond the boundary of the property. Swim and splash in solitude in your own private Eden. Every suite in the property captures the beauty of the outside world. You will recline in the most tasteful and exquisite surroundings. An eclectic collection of artefacts and antiques collected by Ms Karan adorn the spaces. You are truly a guest in her home as you enjoy the pleasures of living a castaway island experience at five-star level. 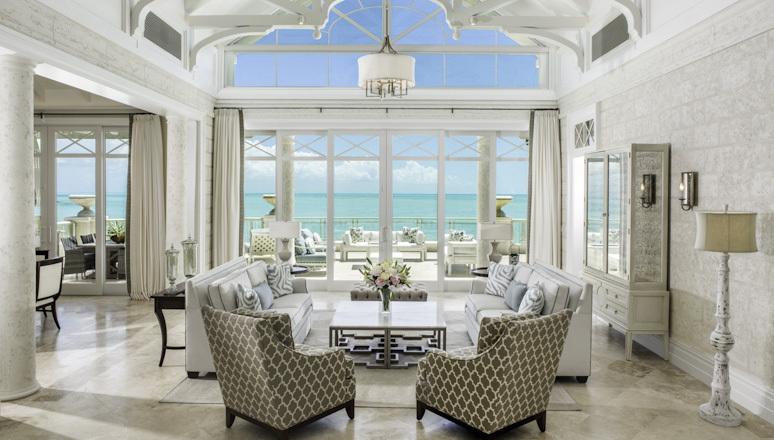 The Sanctuary reflects both the natural serene beauty of Parrot Cay and an incredible peaceful spirit, the hallmark of its fashion designer owner Donna Karan. 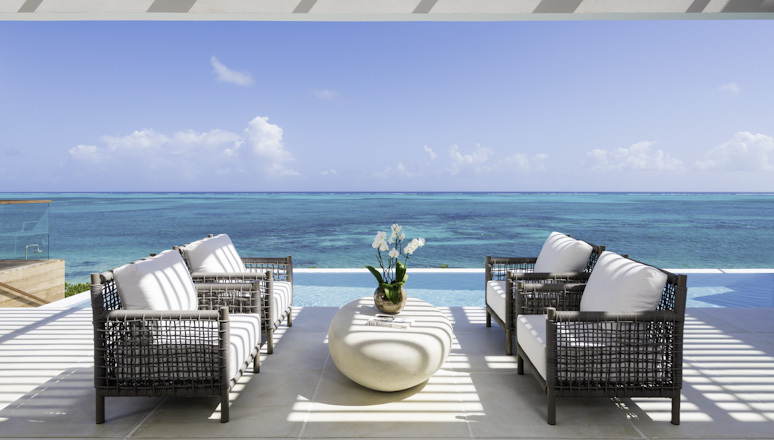 This incredible Turks and Caicos Vacation rental brings accommodation to Turks and Caicos completely new level of luxury. Warm wood and cool limestone interiors flow from room to room. The marvellous sweeping windows frame views over the infinity pool to the ocean beyond. It is a view that changes with the sun and one of which you will never grow weary. Large en-suite bathrooms and outdoor showers and Jacuzzis allow you to embrace that feeling of liberation away from the bustle of so many other Caribbean destinations. The mature gardens are a riot of lush vegetation and colourful shrubs. Nothing has been overlooked in creating this divine destination. Stay at The Sanctuary and experience our personalised COMO butlers. Whether easing you through arrival, organising a castaway picnic for the children or preparing a family meal, they are your dedicated support and chief activities planner during your stay. A complimentary private chef service is included in the room rate for The Sanctuary when the two four-bedroom villas are rented together. When the full 11-bedroom Estate at The Sanctuary is rented, i.e. 2 four-bedroom villas and the three-bedroom villa, the services of 2 private chefs will be included. When not included in the room rate, the rate for a private chef is $350 per meal (1-10 guests), excluding 10% Service charge. 1 private chef for every 10 guests required. It is rare to have an opportunity to step into the stylish and glamorous realm of a world-renowned designer. The Sanctuary is a unique opportunity to unwind and recharge your spirit in an awe-inspiring location. The Sanctuary offers a master-class on how to create a home that captures the beauty and splendour of its natural surroundings at a level of comfort and panache so rarely experienced. Divine!